180 LEDs per kit! --- more than any kit on the market! Features "Smart-Signal" patented technology and "Batwing" design. Up to 5X brighter than stock lamps! Exclusive "Smart Signal" technology prevents unwanted sequencing during braking. 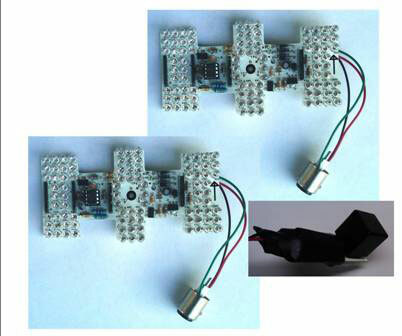 Included in your kit are 2 Taillight Modules ( right and left 90 LEDs each), 1 Flasher Module, and complete illustrated instructions. Nothing else to buy nothing extra to install. Reuse your old lenses since these taillights run cooler than the standard incandescent bulb! Installation is a snap. There is no need to add additional wires or the drill and modify the lamp housing. LEDs ( Light Emitting Diodes ) use less current than the standard Mustang incandescent bulbs relieving stress from your alternator. LEDs last longer and look brighter and redder! New white substrate improves light output!